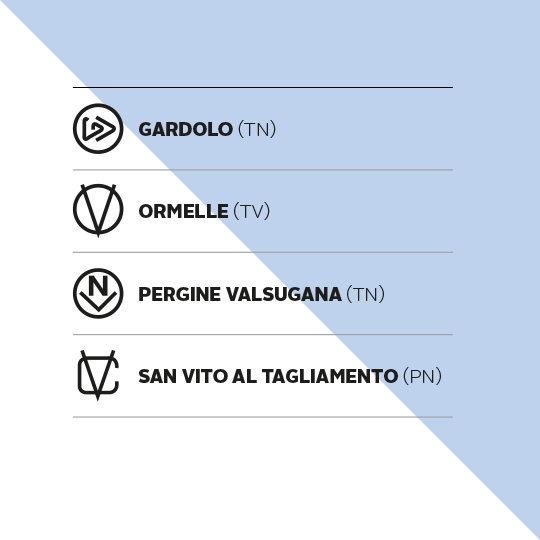 Who | Vetri Speciali S.p.a.
Vetri Speciali is a worldwide leading company in the production and distribution of specialized glass containers for the food industry, whose headquarters are located in Palazzo Fugger Galasso, in the historical heart of the city of Trento. Vetri speciali combines traditional craftsmanship with the most innovative technologies at the service of the large industry, creating a unique alchemy in the global scene. In fact, the company is able to fulfill in a short time both large production demands and micro lot production needs, that can go from a 4 cl format to a 30-liter container. Nowadays, these number have no equals on the global market. Vetri Speciali has established a unique position in the scenario of the industrial production of hollow glass containers for food: Vetri Speciali reaches its customers throughout Italy from where, thanks to the in-house and well-structured commercial department – supported by external sales representatives – sends over 60% of its production. Vetri Speciali is furthermore present in over 52 Countries with its commercial department, which is specialized in foreign markets and composed by English, German, French and Spanish native speakers. We also have a Quality Assurance team dedicated to the care of the clients needs and to the resolution of any problem that may occur. The creative forge of Vetri Speciali every day designs and creates a multitude of shapes and colors according to the most different inspirations and demands, in order to shape every possibility of the imagination. Vetri Speciali indeed stands out for the versatility of its offer, combined with the application of the most advanced technologies: we undertake design and production projects of artifacts with companies of every size and inspiration, interpreting with the tools of visual language every customer's idea and translating his or her intuitions into prestigious special containers.